Our community has been featured in some recent articles and a news video segment. Please click the links below to view these media features. 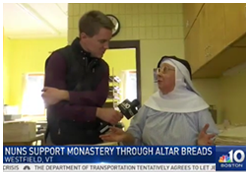 Click here to view the NBC Boston and New England Cable News video aired in March 2018 about our life of prayer and our Altar Bread work. 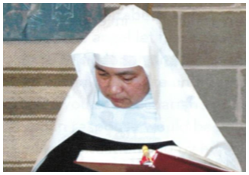 Click here to read an article published in the September 2018 edition of the Vermont Catholic magazine about Sister Myriam's vocational story and making her temporary vows. 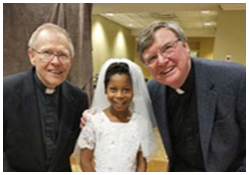 Click here to read an article published in the May 2018 edition of the Catholic News Herald about our Altar Bread being used for the first Holy Communion Mass of the niece of one of our nuns, Sr. Benedict, in North Carolina. 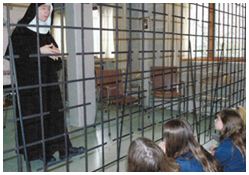 Click here to read an article published in the July 2015 edition of Vermont Catholic about student from St. Francis Xavior School visiting our Monastery and learning about consecrated religious life. 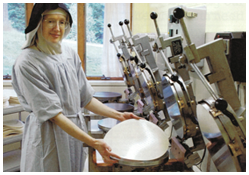 Click here to read an article published in the November 2015 edition of the Vermont Catholic magazine about our Altar Bread work. 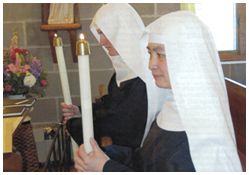 Click here to read an article published in the June 2014 edition of the Vermont Catholic magazine about two of our nuns, Sister Elizabeth Rose and Sister Angelica Marie, making their solemn profession. 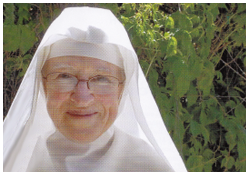 Click here to read an article published in the May 2011 edition of the Vermont Catholic magazine about Sister Elizabeth Rose making her temporary vows. 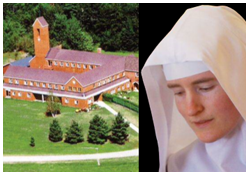 Click here to read an article published in the February 2011 edition of the Vermont Catholic magazine about Sister Angelica Marie making her temporary vows.